It’s always good to know some cat first aid and be prepared for those little emergencies and accidents. Cats are inquisitive by nature and inevitably this can lead to little accidents and mishaps. Add this to their natural territorial instincts and subsequent cat fights and the resulting scratches and bites and as you can having some pet first aid knowledge becomes vital. It goes without saying that if you suspect that your cat is in considerable pain or is very ill then a trip to the vets is your first consideration and should be carried out as soon as possible. No amount of animal first aid can help in these circumstances. We all have off days where we just feel a little off colour and our cats are no different. They may have a slight cold or infection or just be in a particularly quiet mood. Usually this is nothing to worry about and as long as they are back to normal within a few days no cat first aid need be carried out. However if you do suspect that something is wrong then carry out these few simple checks to try and find out what the problem might be, make a note of anything you notice so that you can accurately inform your vet. Check cat’s recent behaviour: are they eating, drinking more often, unable to urinate or defecate, suffering from cat diarrhea or vomiting. Feel the cat gently all over and see if they flinch anywhere in particular or can you feel a lump. Is your pet limping or holding its body awkwardly. Are they breathing heavily or gasping for air. Check their eyes, ears and nose for any discharge or wound. The following is a list of the most common types of injury and ailment that you may come across as a cat owner, once again knowing a little cat first aid will help you to deal confidently with each one before you are able to take them to the vets for a professional assessment. Abscesses – These are little lumps filled with pus, normally caused by a bite or wound. Clean the area with a gentle antiseptic; an antibiotic may be required to fight off any infection that your vet will prescribe. Choking – this can happen if a piece of food like bone or fur becomes trapped in the airway and your cat is unable to breath. Open the mouth and if possible remove the obstacle with your fingers or with tweezers. If this is not possible and there are no other injuries, you can carry out the following emergency first aid for animals procedure. Hold the back legs and swing the cat in a downward motion (avoiding the floor of course). If you successfully remove the obstacle but the cat is still not breathing then place your lips over the cats nose and blow two or three times, repeat as necessary. Fits or convulsions – Make sure the cat is away from any sharp edges or other harmful items and wait for the fit to subside. Place the cat in a dark quite place for a while as they may be disorientated for some time afterwards. Do not excessively handle the cat but ensure that they are able to breath. A vet needs to be consulted to find out the cause of the fits as they may be suffering from epilepsy or may have ingested some form of poison. Limping – gently feel the leg to see if you can feel any bones broken. Then check the feet by pressing gently to splay the toes to see if there is anything embedded in the pads or if any claws have become damaged. Often you will be able to remove any foreign bodies caught in the foot yourself with a pair of tweezers. If it is too painful of is too deep then seek medical attention immediately. 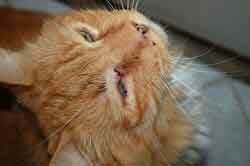 Stings – Just like us, cats can get stung by insects too, usually on the mouth or paws. If visible the best pet first aid you can carry out is to remove any remaining sting and wash with antiseptic. Swelling should only last for a day or so, but always keep an eye on your pet for signs of an allergic reaction. If this happens and their breathing becomes laboured then take them immediately to the vet. Bites and wounds – For shallow wounds or scrapes wash the area with an antiseptic. For wounds that are bleeding badly, clean the area the best you can and cover with a light dressing before taking them to the vets. Bites can easily become infected due to the bacteria carried in a cats mouth, it is usual for the bite to swell, however as long as the cat is not unduly worried by it and doesn’t seem in distress, wash the wound with antiseptic and keep out for any signs of infection which would require antibiotics. 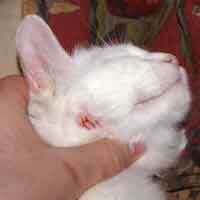 This is where cat first aid leaves off and professional care is required. If medication is required to be administered at home then your vet should be able to advise on how to this. But giving pills and medicines is not as difficult as it may appear. 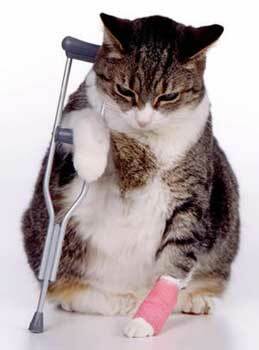 For more information about cat injuries and how to deal with them please see my page about cat emergencies. It is good to make sure you have a separate cat first aid kit available at all times. Pet first Aid Kits can be bourght complete with everything you could every need. This one for instance Is the ultimate animal first aid kit.